NOTE: this quick reference chart is NOT a substitute for the complete Weight and Balance information contained in Section 14 of the Builder’s Manual. CAUTION: the Gross Weight is established by the builder, who is considered the manufacturer. CAUTION: The Aerobatic Gross Weight is set by structural limits. 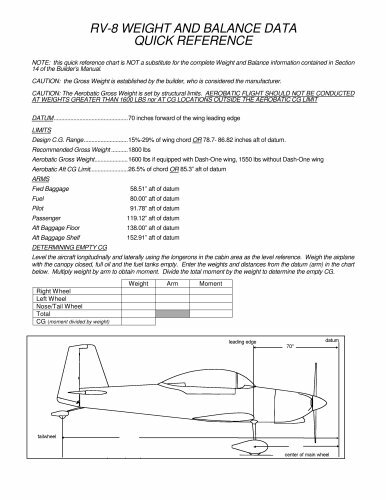 AEROBATIC FLIGHT SHOULD NOT BE CONDUCTED AT WEIGHTS GREATER THAN 1600 LBS nor AT CG LOCATIONS OUTSIDE THE AEROBATIC CG LIMIT ARMS Fwd Baggage 58.51 ” aft of datum Aft Baggage Floor 138.00” aft of datum Aft Baggage Shelf 152.91 ” aft of datum Level the aircraft longitudinally and laterally using the longerons in the cabin area as the level reference. Weigh the airplane with the canopy closed, full oil and the fuel tanks empty. Enter the weights and distances from the datum (arm) in the chart below. Multiply weight by arm to obtain moment. Divide the total moment by the weight to determine the empty CG.